Processing | Friederichs Seed, Inc. The Friederichs Seed processing facility utilizes the newest technology to produce the highest quality soybeans, sunflower and wheat. 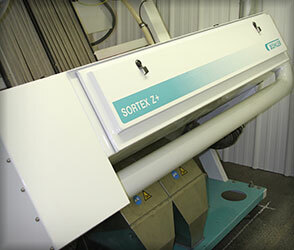 Separate lines allow for the unmixed processing of wheat and soy/sunflower. The plant also incorporates the use of air sieve machines, de-stoners, gravity separators, precision sizing, indents, sprirals, and a Sortex color sorter with shape recognition and multiple magnet passes. Our plant was specifically designed for the gentle handling of soybeans, wheat and sunflower. All products are handled via conveyors and bean ladders to minimize damage and breakage. Packaging and shipment options include paper bags, bulk tote bags, or general bulk truckload/container quantities. With several large warehouses totaling 50,000 square feet, Friederichs Seed has ample space to separate and hold food grade products as well as feed and seed products. FSI also offers dedicated bulk storage for sunflower, soybeans or wheat, with a 400,000 bushel capacity. We can also segregate smaller lots through the use of our numerous smaller bins. Ready for more information? Give us a shout!